The urban homesteading movement is spreading rapidly across the nation. Urban Homesteading is the perfect "back-to-the-land" guide for urbanites who want to reduce their impact on the environment. 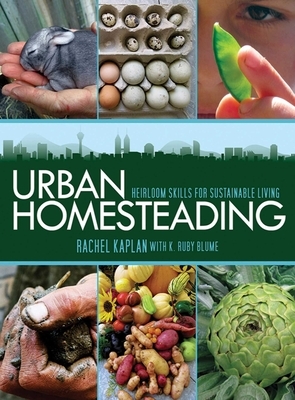 Full of practical information, as well as inspiring stories from people already living the urban homesteading life, this colorful guide is an approachable guide to learning to live more ecologically in the city. The book embraces the core concepts of localization (providing our basic needs close to where we live), self-reliance (re-learning that food comes from the ground, not the grocery store; learning to do things ourselves), and sustainability (giving back at least as much as we take). Readers will find concise how-to information that they can immediately set into practice, from making solar cookers to growing tomatoes in a barrel to raising chickens in small spaces to maintaining mental serenity in the fast-paced city environment. Full of beautiful full-color photographs and illustrations, and plenty of step-by-step instructions, this is a must-have handbook for city folk with a passion for the simple life.